and other classic small-wheel bicycles. I've decided that it is worth adding reviews of items that I have purchased and used. Reviews are independent - I'm not on anybody's payroll. If you have a review of any bicycle-related item, let us know via the forums and we'll consider publishing it. Pros: Great price, practical, stylish and functional. Cons: Does not include mounting bracket. 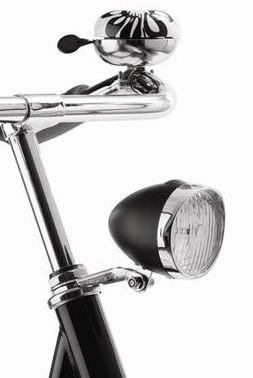 A modern take on a classic style of bike headlamp - will look great on any bike - especially retro old bikes, Dutch bikes and town bikes. - Upto 50 hours battery life time. This was a bit of an impulse purchase on ebay. I've been looking for one of these lights for years, but there were never any to suit my requirements before the AXA Classic LED Battery Headlight. I wanted something that was battery-powered, self-contained, used LED technology, reliable, and easy to install. Most importantly, I did not want to pay the high prices for the (undoubtedly high-quality) German makes. The AXA Classic Headlight meets all my basic requirements. It is simple to use. One switch with two settings "on" and "off." No flash, no patterns, no funky settings, no fuss. It comes with the requires batteries included and already installed! All that is left for the purchaser is to fit it to the bicycle. Now, I did make the mistake of not reading the advert closely enough. I had assumed that it would come with mounting brackets, but you must supply your own. Fair enough, I suppose. Given the myriad of mounting options for this type of headlight, it would be better to sell the brackets separately rather than try to cover all bases and probably triple the cost of the product. I re-purposed an ABS plastic mounting originally intended for a front white reflector. While I am sure that there are better mounts out there, this was in my spares box and seems to work perfectly fine. I mounting mine to the stem, below the handlebars where it is out of the way. 4 lux might not seem like a lot, but this headlight uses it quite effectively. The lens has a focused area with which you can see the road ahead, and then throws weaker light around to make you visible to other traffic. It isn't a super-powerful light for riding on MTB tracks at night, but anyone buying this style headlight isn't planning to do so. Clearly, it is intended to be a fashionable and functional item on a traditional city bicycle. What can I say? It does the job nicely. The trouble is that it looks so nice, that the rest of my bicycle now looks comparatively shabby, and will need a complete strip down, overall and re-spray. Addendum: Practical cycles sell a suitable bracket to mount this light to your fork brake boss. Pros: Small, simple, lightweight, good battery life. 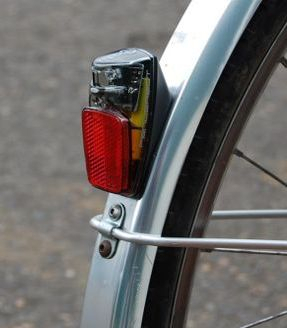 The Fenderbot™ tail light is a rock steady safety signal designed to make you more visible. It's equipped with a precision reflector and super bright red LED. The Fenderbot™ bolts directly to your fender to prevent theft, so you will need to summon your DIY skills and drill two 5mm holes 20mm apart on your fender. I do rather like this light. Drill two holes in your rear mudguard/fender, mount with supplied hardware, and away you go. A nice feature of the design is the small screw which makes it easy to replace the batteries without having to pull the whole light off your mudguard. At a mere 62 grams, it isn't likely to cause any load strain on lightweight plastic mudguards. I find the various dancing patterns offered on many tail lights today to be extremely annoying if you're in a group ride behind one of them. Worse still, as a driver it is all too easy to ignore a dancing pattern light and fail to recognise that there is someone on a bicycle there! PDW have been most sensible in offering two modes: Steady and Flashing. I like lights like this. What do I not like about this light? Well, to be honest, it doesn't appear very bright unless you're looking straight at it. I would have gladly sacrificed a little battery life if there was one very bright LED in the middle and two small ones facing outwards a little to throw more light out. That said, it is still quite an effective little unit that does its job without fuss. I say get one. Get one for each of your bicycles so that you're never stuck in a situation where you have to ride at night without appropriate lighting. I give it 8/10. AXA Classic LED Battery Headlight.